Have you been looking for the gem Peridot, but have never seemed to find it in a setting or piece of jewelry that you absolutely adored? Do not worry about that anymore! These amazing earrings have everything you could ever want and need in a piece of jewelry. The Peridot is shaped in a beautiful heart which helps add the look of elegance that every woman wants to have in her daily outfit, or maybe it is just the right piece to finish off her dinner attire. These 4mm Peridot earrings are fitted into 14K Yellow Gold which accompanies the green light of the stone in a beautiful manner. The color of the stone is almost like a lime green, which, in today's generation, is very popular and trendy with a hint of edge combined. If you have been searching for just the right accessory, you have definitely found it. These are the best pieces you can pair with anything, and who doesn't love virtually endless possibilities? 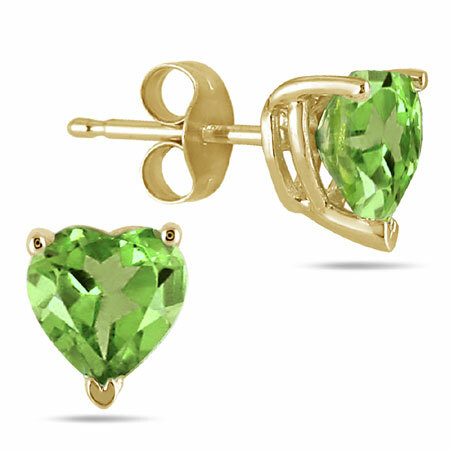 We guarantee our Genuine Heart-Shape Peridot 4mm Earrings, 14K Yellow Gold to be high quality, authentic jewelry, as described above.